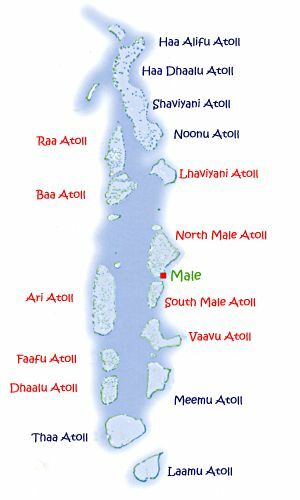 The outer reef slope of the atolls are generally distinguished by greater depths and increased clarity of water. The visibility may exceed 50 metres. Looking down the reef slope, the coral communities change rapidly with increasing depth. At depths greater than 20 metres, wave surge is non-exisitent and extensive coral growth may occur to depths of 50 metres and more. Light availability is the main factor limiting the range of coral here. The upper parts of the outer reef slope may be affected by wave action, restricting the growth of more delicate plate coral . Coral growth can be wiped out in a single freak storm in this zone.. In areas less exposed to wave action, extensive growth of staghorn acropora occurs. A great variety of fish life occurs among the coral in this zone. The reef front is the part of the reef which takes the full force of the ocean swells. The coral here tends to be gnarled and stunted as a result of the pounding waves. The reef flats can range in width from a few metres to a few kilometres. Rainwater can damage or completely destroy the coral in this zone if heavy or cyclonic rainfall coincides with very low tides. Lagoons with good circulation of water may have large stands of branching acropora growing on the sand. Lagoons can trap many varieties of fish as the tide recedes. On the inner reef slope, coral growth may be rich if the slope is not too steep. Steep or vertical slopes may be bare. Many interesting caves, overhangs and gullies can occur in this zone. The atoll floor consists mostly of sand and rubble and is usually at a depth of between 30 and 50 metres. Rising from the floor are the giris and thilas. The giris nearly reach the surface, whereas the thilas lay below at depths between 5 and 15 metres.